“The foremost is, ‘Hear, O Israel! The Lord our God is one Lord; and you shall love the Lord your God with all your heart, and with all your soul, and with all your mind, and with all your strength.’"
What does it mean to love The Lord with all your heart? What does it mean to love The Lord with all your soul? What does it mean to love The Lord with all your mind? What does it mean to love The Lord with all your strength? Each reference is slightly different. Clearly, everything about Deuteronomy is different than the incidents in the Gospels. Matthew and Mark are the most similar. Luke stands out as unique in its own right. This exercise in comparison and contrast may or may not highlight significant differences. However, it affords a degree of familiarity with the passage in question. The most obvious elements in this topical study is the presence and order of the topics in question. 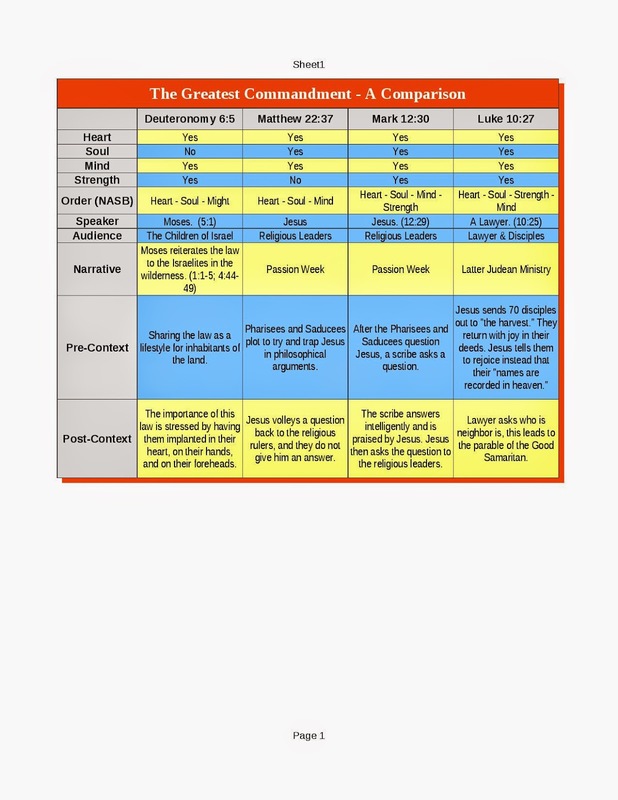 Notice that the gospels add the "mind" topic which is not present in the Old Testament text. Notice also that the order of the topics are shuffled somewhat. Again, it is not a big issue. Just something to be aware of. Audience: Who are they talking to? Narrative: Where does this take place in the story? Once we are clear on these things, then we can delve into deeper analysis of the text. After deeper analysis, we can begin with applications. 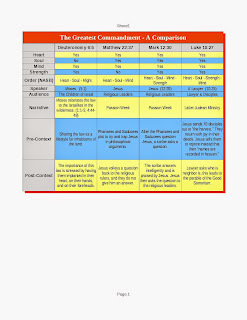 Here is a pdf of this comparison. Check it out and be sure to a) correct any mistakes I made and b) suggest any more elements we could compare/contrast between these passages. How can you do this? Just leave me a comment below!